There are parallels between our text for today and the Old Testament lesson (Genesis 3). During the Epiphany season, we talked about the baptism of Jesus, because His baptism was an epiphany, or a revelation of the power and glory of God. At His baptism, God the Father spoke in a voice from heaven and the Holy Spirit descended on Jesus in the form of a dove. The Greek word, Christ, the same as the Hebrew word, Messiah, means "The Promised One" or "The Chosen One", but literally, "The Anointed One". In the Old Testament era, to consecrate a prophet, priest or king in office, they anointed or poured oil on their heads. Jesus was anointed by the Holy Spirit as a prophet, king and priest, because as the Christ or Messiah, He possessed all three offices. In our text for today, as in the narrative of all the synoptic gospels, immediately after His baptism, Jesus was led by the Spirit into the desert, to be tempted by the devil. Because Jesus is the second Adam, the father of a regenerate humanity. The first Adam was the father of sinful humanity because of his disobedience and that of his wife, Eve. God created the two to care for the earth, to fill the earth with their offspring and to live on earth as the children of God. However, Adam and Eve fell into sin because they were deceived by Satan, the devil. The book of Genesis speaks of the serpent. "But the serpent was cunning, more than all the animals of the field that Jehovah God had made." These verses seem at first glance to be a fable of why there are serpents in the grass that bite the feet of men. But this snake is not just a snake. Revelation 12: 9 identifies him as "the old serpent, called the Devil and Satan, who deceives the whole world." Then, Genesis 3:15 says, "And I will put enmity between you and the woman, and between your seed and her seed; He will strike you in the head, and you will bruise his heel. " It is clearer in the original language, the seed of the woman will strike the head of the same serpent, not its offspring. Moreover, He who will strike the head of the serpent, that is, the devil, will be the seed of the woman, not of man. This is the first messianic prophecy and points to the birth of Son of God of the Virgin Mary. Adam and Eve did not pass the test. In the Garden of Eden was harmony between God and human beings, man and woman, and human beings and creation. The disobedience of Adam and Eve destroyed everything. "To the woman he said: I will greatly multiply your pains and your pregnancies; with pain you will give birth to children; and your desire will be for your husband, and he will rule over you. And to the man he said, Because you obeyed the voice of your wife, and ate of the tree which I commanded you, saying, You shall not eat of it; cursed shall the earth be for your sake; with pain you will eat of it all the days of your life; thorns and thistles will produce for you, and you will eat plants of the field. With the sweat of your face you will eat bread until you return to the ground, because from it you were taken; you are dust, and you will return to dust. " And the punishment was not only the difficulties in this world and physical death; also eternal death. "And the Lord God said, Behold, man is like one of us, knowing good and evil; Now therefore, let him not stretch out his hand, and take also from the tree of life, and eat, and live forever: And the LORD God brought him out of the garden of Eden, to till the ground from which he was taken. So he drove out the man, and put east of the garden of Eden cherubim, and a flaming sword that turned on all sides to keep the way of the tree of life. " He who deceived Adam and Eve was the devil, the rebellious archangel who wants to destroy the human series and all of creation because of his hatred of God. And the devil himself tried to deceive Jesus, but it was different with the second Adam. We begin the season of Lent with the story of the temptation of Jesus because Lent is derived from fortieth, that is, forty days. Jesus fasted forty days and forty nights in the desert. The Lenten season lasts 40 days, not including Sundays, because every Sunday is a celebration of the resurrection. But in the weeks of Lent, we remember the fast of our Lord in the desert. Also, the 40 years of the people Israel in the desert, when they only had manna to eat and water from the rock. The new life for us begins with baptism, as the journey of the people of Israel began with their escape from slavery through the waters of the Red Sea. We also have a long journey to our entrance into the Promised Land, with the body and blood of Christ in the Holy Supper as our spiritual food and drink. In addition, we remember Jesus Christ as the representative of Israel in His temptation. Because the majority of the people Israel did not fulfill their old covenant with God, but one of Israel, Jesus, fulfilled it all. After the fast of 40 days and 40 nights, Jesus faced the devil. "And the tempter came to him, and said to him, If you are the Son of God, say that these stones should become bread. But He answered and said: "It is written, Man shall not live by bread alone, but by every word that proceeds from the mouth of God." Jesus rejected the first temptation of the devil with the Word of God. The quote, "Man shall not live by bread alone, but by every word that proceeds from the mouth of God," is from Deuteronomy 8: 3 and is the words of God to the people of Israel after 40 years in the wilderness. They survived in the desert because they trusted in God's promise. He sustained them with the material bread, but first they had to trust in His Word. But, mind you, the devil can quote the Bible too. 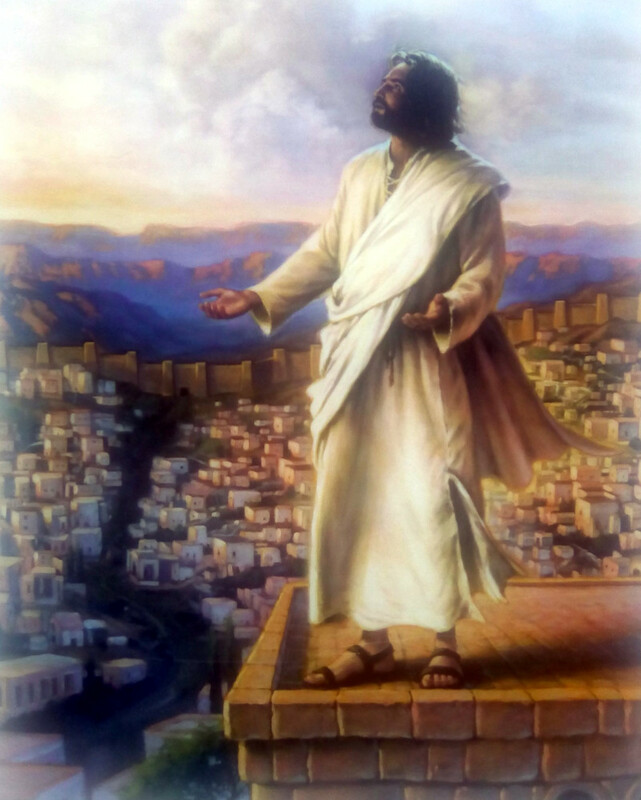 "Then the devil took him to the holy city, and placed him on the pinnacle of the temple, and said to him: If you are the Son of God, cast yourself down; for it is written, He will command his angels regarding you, and they will hold you up in their hands so that you will not stumble with your foot on stone. " This is a quote from our psalm for today, Psalm 91. In many houses in Venezuela, there is a Bible open to Psalm 91, because people think that's why they have protection against evil spirits. But, the devil cited these same words for his purpose. Apart from the faith that the Holy Spirit gives us, the text itself has no power. "Jesus said to him, It is written also, 'You shall not tempt the Lord your God.'" This quote is from Deuteronomy 6:16 The devil may use biblical quotations in a distorted sense, so we must study the Scriptures for all its counsel. “So the devil took him to a very high mountain, and showed him all the kingdoms of the world, and their glory, and said to him, "All this I will give you, if you fall down and worship me." Then Jesus said to him, "Go away, Satan, because it is written: You shall worship the Lord your God, and you shall serve Him only. " This temptation is the temptation to establish the kingdom of God on earth by the sword. To act in this way is to worship the devil. Because the work of redemption and reconciliation between God and man is by grace, an undeserved gift. In this work, the church only has for its arms the Word and the sacraments. Jesus passed the test to be the Savior and continued with his public ministry until His death on the cross. In His temptation, Jesus is an example for us in our trials and temptations because He did not trust in power and vainglory, but only in the Word of God. We trust in God for our daily bread. We trust in God for the protection of His holy angels, also for the forgiveness of our sins and eternal life. In this way, we have the peace that surpasses all understanding. Amen.